Chimpanzees cooperate with each other in various ways but the underlying motivation of these behaviours is not always clear. For this reason, the Max Planck researchers focused on the psychological factors that might explain cooperation in chimpanzees. 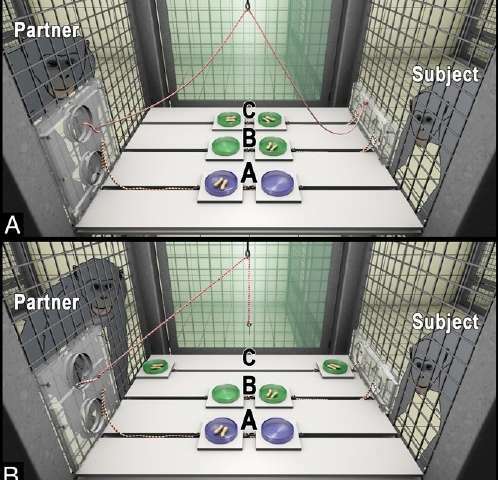 In a series of behavioural studies the chimpanzee subjects' access to food was blocked and had to be released – either by the assistance of a conspecific partner or without the partners help. The chimpanzees could then choose between two options: one that provided food to both the subject and their partner and one that only provided food to the subject. The results were very clear: chimpanzees preferably chose to provide food to both themselves and their partner – but only if it was the partner that had made this choice possible. The animals were particularly generous if their partners had risked obtaining no food for themselves at all by providing their assistance. This behaviour confirms game theory models on social cooperation previously researched at the Max Planck Institute for Mathematics in the Sciences that had provided the impetus for this behavioural study collaboration. Material rewards are considered a key component of human cooperation. The results of the current study show that, under certain conditions, chimpanzees are as willing as humans to show their gratitude to their conspecifics even when costs are involved. "What surprised us most was that the chimpanzees even gave up extra food to reward a conspecific's support. 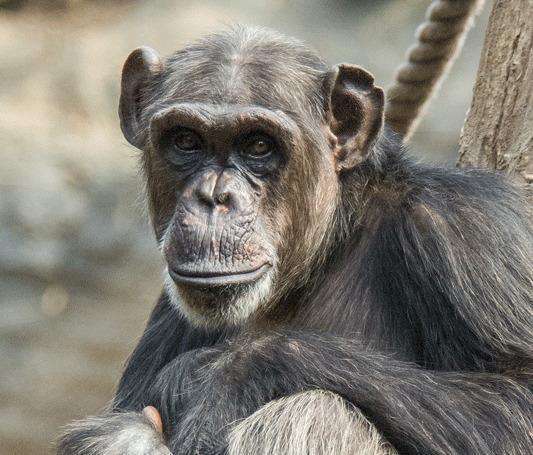 This contradicts the common assumption that chimpanzees only care for themselves as soon as a chance for more food is involved," says Martin Schmelz, one of the study's authors. It appears that the animals can even assess the magnitude of the reward their partner has earned: the more the latter has risked, the greater the willingness to offer a commensurate reward. "The findings suggest that the chimpanzees take into account not only the actions of their test partners but also their cooperative intentions, and that they can differentiate truly prosocial behaviour from potentially self-serving acts," says Sebastian Grüneisen, another of the study's authors. "They also show that the animals integrate recent single events into decisions, even if this puts them initially at a material disadvantage." Hence, chimpanzees might engage in a kind of "emotional bookkeeping" and make emotionally-based social decisions. It is possible that they want to reciprocate their partner's willingness to cooperate and to signal their desire to establish social ties. This assumption is consistent with the finding that chimpanzees have higher levels of oxytocin – a hormone involved in the formation of social ties – in their blood when they cooperate with conspecifics. Further studies on chimpanzees and on the potentially even more social bonobos could confirm these findings. Game theory, when performed by hunter gatherer people, gives results completely different to those found in college students and all previous western cohorts. See the paper ''Economic Man' in Cross-cultural Perspective: Behavioral Experiments in 15 Small-scale Societies' by Joseph Henrich et al. And as for the contention that "Apes only provide food to conspecifics that have previously assisted them", this clearly can't be true as young apes have never been provisioned by any other than their mother but mature apes clearly have friends and so apes MUST provision those who have not provisioned them previously or the system would not work. These studies appear to be strongly geared toward supporting preconceived ideas rather than emulating natural conditions in which the chimps actually live. In fact I have yellowing books with almost identical studies in them, but different interpretations. Is the far right Trumpian politics now reinterpreting old scientific data in an individualistic light?